04-Jan-2018 -- This is the 9th out of 11 reports reaching confluence points during our two-week trip through southern Brazil and eastern Paraguay. The story starts at 23°S 46°W and continues from 26°S 57°W. The itinerary and additional pictures can be found here. Midday we reached the town of San Ignacio. After lunch, we drove 20 km southwards on a cobble stone road and another 1.5 km on a dirt road up to 500 m distance to the confluence point. From there we followed foot paths across varying pastures thereby bypassing a farmhouse, a little forest and finally we dropped down to a pasture where the confluence is located on. 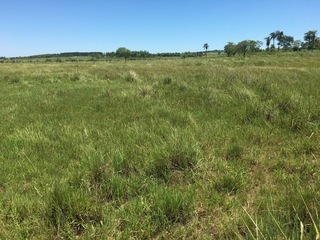 The confluence was located right in the middle of a pasture with grazing cattle. The cows ignored our doing. Besides high grass and reeds there are some flowers growing at the confluence point. On the way back, we encountered a hidden field where they grow marihuana. We continued our drive towards Encarnación as the southernmost place in Paraguay. The story continues at 27°S 56°W.